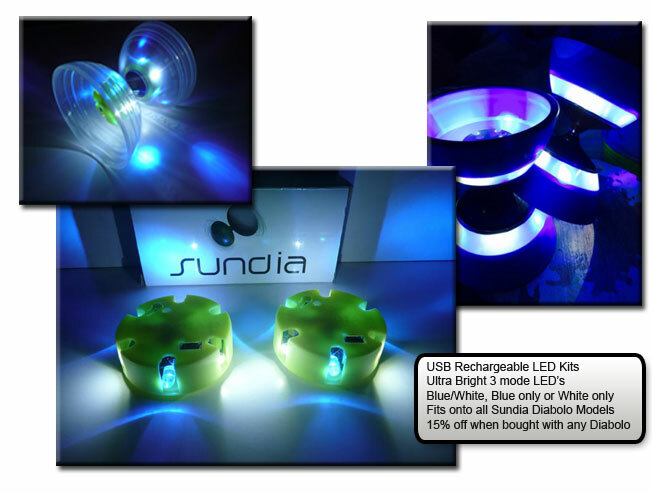 This new LED kit from Sundia is extremely bright and has 3 modes - Blue and White together, Blue only or White only. Each side has 6 LED''s 3 Blue and 3 White and can be recharged with a standard mini USB cable (not supplied). These LED''s are perfect for stage performances as the lights are super bright. This is the newest version with upgraded batteries and sleep mode to prevent accidental switch on (need to press and hold for 1 second to turn on). Battery life has been extended to approximately 1.5 hours in full Blue & White mode, 2.5 hours for Blue only mode or 3 hours for White only mode. Note: The newer version now has a WHITE cover not the yellow cover. 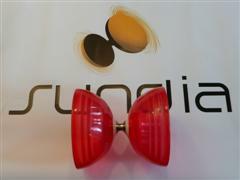 Fits onto all Sundia diabolos and includes special retaining nuts so that you can quickly install / remove the LED''s by hand without any tools, allowing you to use the diabolo with or without the lights attached. Two light units are supplied (one for each side). You can get 15% off the price of this item when you buy any diabolo on the same order - Use the discount code LED15 at checkout. The LED''s only fit with flat ''Fly type'' plastic washers, carbon fiber or metal washers. They do not fit with the domed style plastic self locking washers supplied with some of the fixed axle diabolos and axle sets.